Easter Buns and Chocolate Eggs are the treats of Easter time. If you thought giving up gluten, grains and refined sugar put a stop to those treats, then you can think again. Here is a little selection of Easter Buns and Chocolate Eggs from paleo and primally inspired bakers and bloggers. Take a dive in, select one or two and get making and baking. Have a happy, restful, peaceful and mindful Easter weekend. 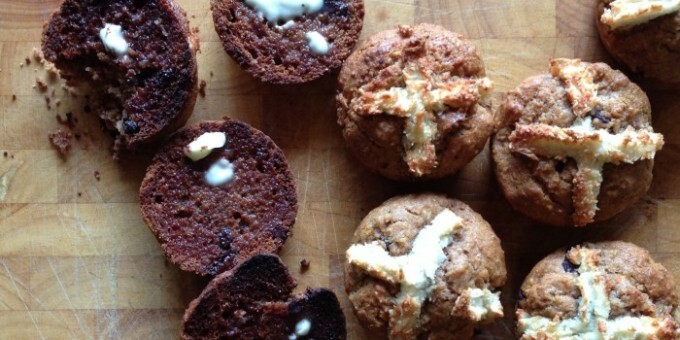 Hot Cross Muffins, I just had to feature my own creation first up, didn’t I? I promise you that this recipe is simple to put together, smells divine in the oven and is tasty with the warm spices of Easter. Enjoy them warm with a lovely dollop of butter or your favourite spread. One of my favourite Low Carb Healthy Fat blogs. I recommend their book, What the Fat? – Fat’s IN, Sugar’s OUT as a great resource for a low carb, healthy fat diet and recipes you will want to use every day. 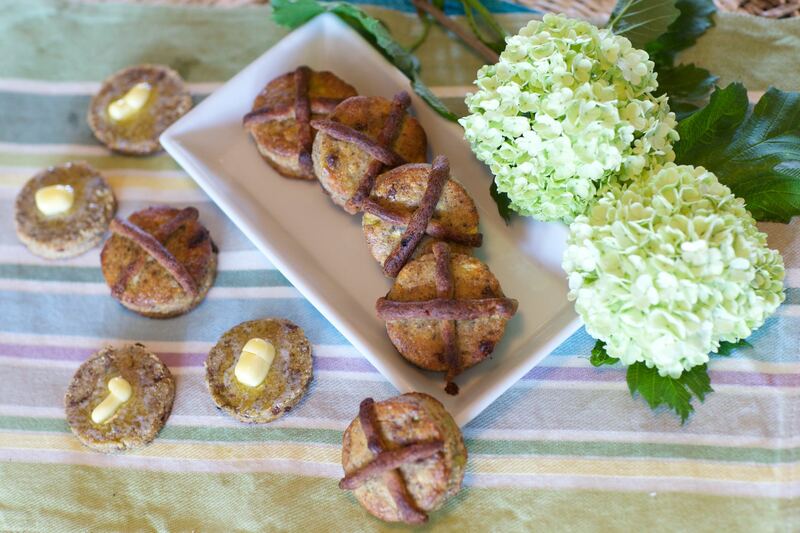 With around 4.5g of Carbs in each, you can enjoy these lovely Easter Buns guilt free. The recipe makes 12 – 16 buns. Emma and Carla Papas are health and happiness advocates, passionate entrepreneurs and health coaches. They are on a mission to merrymake over the world! 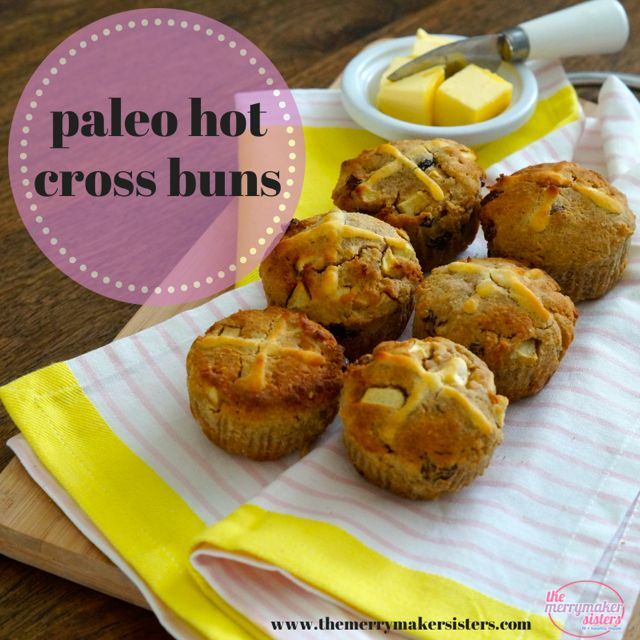 And their paleo Hot Cross Buns are pretty tasty. Sarah Wilson from I Quit Sugar has created chocolate Hot Cross Buns. Toast these treats to get the full flavour. Take care now and don’t eat these all at once – be nice and share them around! Another awesome low carb recipe resource with a simple philosophy – Don’t eat CRAP – Caffeine, Refined foods, Additives and artificial colours, Processed and packaged foods. These lovely eggs, are not only grain, gluten and egg free they are dairy free as well. Amy and Bec – sisters share a passion for holistic health and natural beauty. Their food philosophy is based on paleo and JERF – Just Eat Real Food! Well I have cheated with the final Easter Egg treat as I made these as Christmas treats! No matter, they are roundish and deliciously chocolatey treats with a hidden surprize, so who can complain! . Treats sorted! 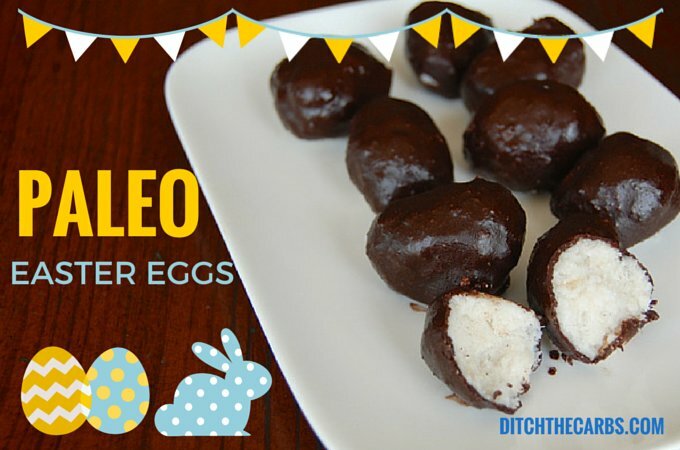 Enjoy making, eating and sharing some of these. Be mindful that these are treats to have now and then – like at Easter! Take the time to savour and enjoy them. Hope you make some this Easter! Great list! Not sure which I want to try first! I’d start from the top 🙂 then switch to the chocolate eggs! What a fab line-up! 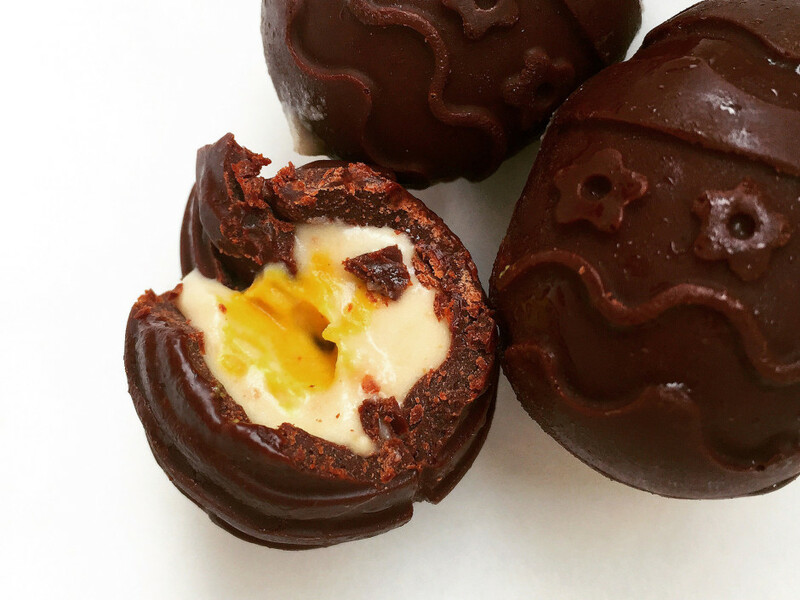 Thank you ever so much for including my Paleo Creme Egg recipe 🙂 Happy Easter!